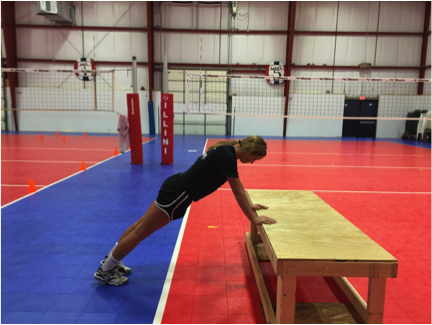 In the last few years there has been plenty of research and innovation going on in the sport of volleyball in terms of how we train. This can be partially attributed to the increased attention that is being given to injuries as of late; including overuse injuries, which have grown tremendously in its relevance. This led our club, Illini Elite, to take a look at ourselves to see not only how we are preventing injuries to our players, but also how we are training them as a whole. We were lucky enough to have some extremely helpful guidance along the way. We enlisted the help of Randy Ballard, athletic trainer with the University of Illinois Women's Volleyball team. In addition to his role with the volleyball program, Randy has also trained Track & Field athletes, both at Illinois as well as with Team USA. He has done tireless research on the topic and continually improves the tactics and strategies that he and the athletic training staff implement. The first step of the process was to figure out what would be the most important areas for us to focus on. In deciding this, we needed to take into account where in the maturation process our players were. As you would imagine, this can vary greatly between a 14 year old compared to an 18 year old. Certain methods would be either less feasible or would be less indicative of deficiencies that we were looking to measure. Randy was also able to give us feedback on deficiencies he consistently sees players arriving with at the collegiate level. We can then prepare them to be at their best while they are playing at our club, and also arriving at college much closer physically to where they need to be. After we figured out the important areas to attend to we needed to then come up with a plan of action for addressing those issues. We were able to do this in a couple different ways. The first was to adjust certain aspects of our active dynamic warm-up, which our players complete at the beginning of every practice. We noticed that some of the things that we were doing were outdated, unnecessary, or at least somewhat counterproductive. We were able to replace these parts with exercises or stretches that were in line with our new agenda. The other way we addressed these areas of concern was through our lifting/conditioning program. Prior to last season, after years of designing our own programs, we decided to partner with Warbird Training Academy. Warbird is a local company that provides training and designs programs for individuals and groups in the Bloomington-Normal area for a variety of sports. We were able to work in conjunction with them in order to ensure the program was designed to suit our needs. Between this and adjusting our active dynamic warm-up we were able to cover all 3 areas in a variety of ways. You may more commonly refer to Trunk Integrity as "core strength" or something along those lines. 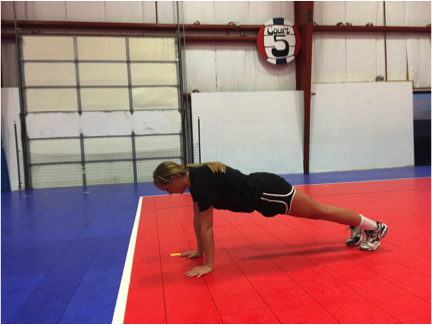 However you word it, it is an extremely important aspect of volleyball. 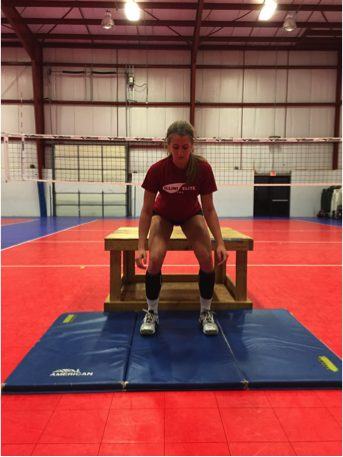 A majority of volleyball movements require strength from this area in order to perform them at a high level. Examples include creating torque when hitting, maintaining posture/body position when passing, properly penetrating/resisting force when blocking, etc. We were able to address this area of concern a few different ways. The first is through our warm-up routine which is done in lines from one end line to the other. Players begin in push-up position at one end line. They stay in push-up position as they walk three times and then perform a push-up. They repeat this process until they reach the center line where they rotate 180 degrees and continue to the end line. As they perform this we are looking for the players to keep their hips in a straight line from their shoulders to feet. As they perform their push-up we are looking at two different aspects. One is how far down players are able to go during the eccentric phase. The second is how the concentric phase is initiated. Players with a high level of trunk integrity will be able to keep their bodies in line as the concentric phase is initiated. Players with a low level of trunk integrity will have their hips dip down during the concentric phase. Another way that we attempted to address this issue was through our lifting program. We used boxes of different heights in order to allow for variance in ability level. Players with the highest level of trunk integrity would do push-ups at ground level. As the level of trunk integrity decreases players would use a higher box in order to reduce the strain on the muscles to perform the skill correctly. 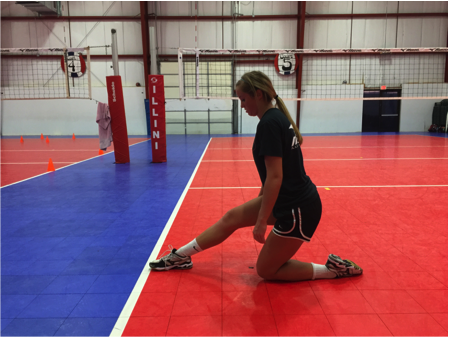 Ankle mobility and flexibility is an area that often goes overlooked in volleyball. 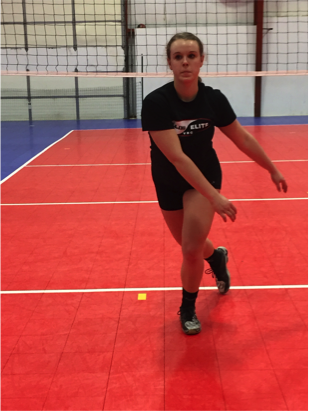 However, we all know many players who have a difficult time either getting into or maintaining proper serve receive or defense positioning for an extended period of time. As a club that prides itself on its ball control we felt this was a very important aspect to address. The strategy that we employ is an exercise called Calf Rock-Backs. This was another exercise which we added to our active dynamic warm-up. 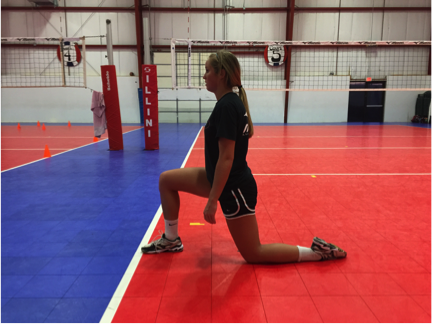 Players will position themselves down on one knee with their opposite leg at 90 degrees. While keeping their whole foot on the ground they will slowly rock forwards and backwards. Players will be tempted to pick up their heel as they rock forwards and pick up their toe as they rock backwards. It is important to continually remind them to keep their whole foot on the ground. The goal of the exercise is to increase the range of motion both forwards and backwards. If you were to picture a protractor on the side of their shoe, picking up either part of their foot would be the equivalent of tilting the protractor which would not increase the degrees of mobility. Our players do this about 4 times on each leg. Landing CompetencyLanding Competency has become an increasingly popular lately because of the focus on ACL injuries. This is an area that we have found plenty of different ways to try and address. The goal of almost all of these activities is to have the knee in a straight line along a vertical plane and for your hips to be straight as well along a horizontal plane. A common sign of a deficiency is a valgus, which is where the knee will bend out. Another sign of a deficiency is when players compensate by shifting their hips to help maintain balance. A couple of the ways that we used to address are included in our warm-up. The first is just a simple lunge to focus on the basics. You would be surprised by how many players have a hard time performing this as it should be done. The focus is for their toe to be pointing forward while keeping their knee in a straight line as the go down into the lunge. 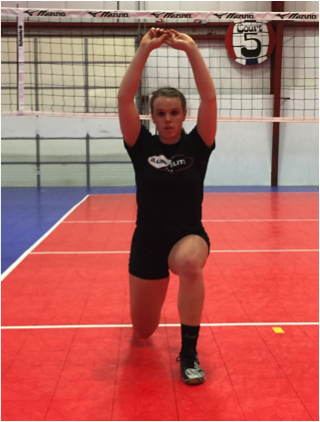 We have players keep their arms up in order to help maintain their balance while keeping their hips in line. Another way that we address this is with an exercise we call Speed Skater. Players jump out onto one leg and let their opposite leg and arms go out to that side. They repeat this on the other leg and then one more time on the initial leg before taking a 2 step approach and landing. The goal is to maintain a straight line with their knee and hips as their body weight attempts to carry them to the side. We also address this issue in our conditioning program. The first way is by performing depth jumps. Players will stand on the end of box in an athletic position. They will lean out while on one foot until they basically fall. They will land on 2 feet while absorbing their body weight on the landing. 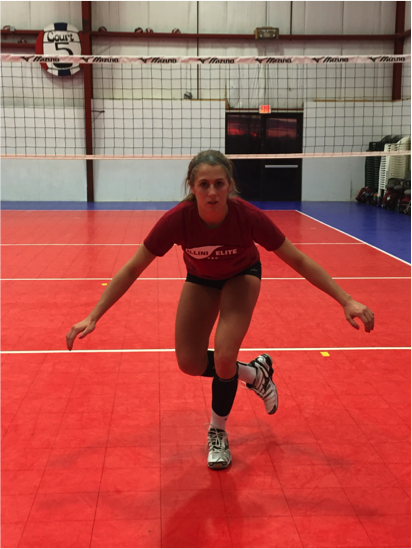 This is a very typical exercise to see a valgus in the knee as the player lands. This is especially true in female players due to their body structure and hip width. 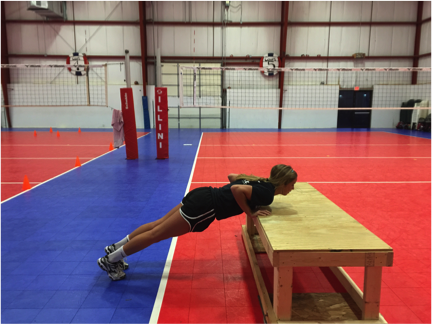 Although this is an easier activity in a physical sense, it is important that players not just go through the motion. 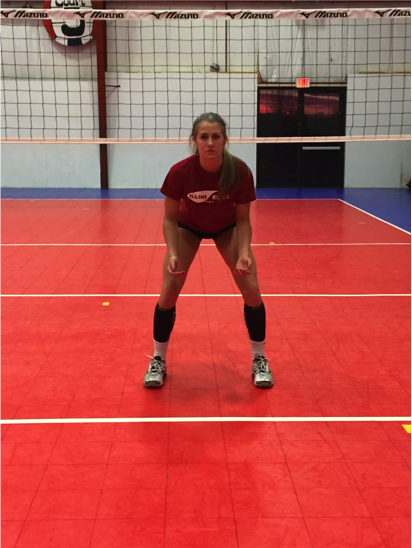 We consistently remind our players to hold their landing and observe the angle of their knees. Lastly, we do what we call a 2 to 1. Players will stand in an athletic stance with both feet on the ground. They will then bound out and land on a single leg. 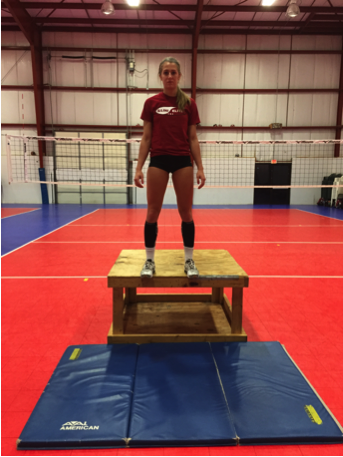 This is an activity where you will commonly observe players compensating for their landing by changing the angle of their hips displacing their weight to balance. Players should repeat this on both of their legs. Illini Elite Volleyball Club is a member of the Junior Volleyball Association. 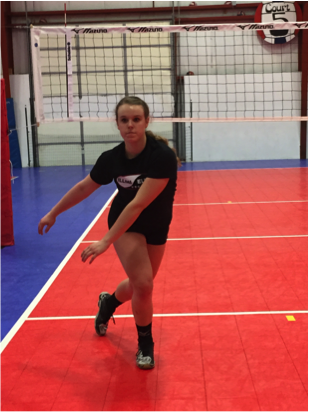 For more information on the JVA and improving your youth and junior volleyball club click here.